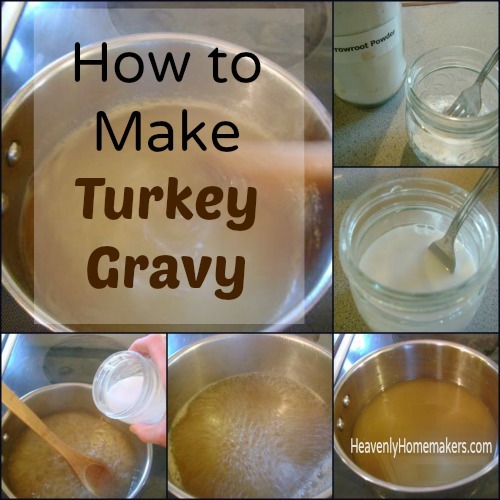 Turkey Gravy is easy when you follow these steps! Step One: Pour broth into a medium saucepan. Step Two: Spoon arrowroot powder (or cornstarch or flour) into a small jar or glass. Step Three: Add water to arrowroot powder and whisk smooth with a fork. Step Five: Slowly pour arrowroot powder (or cornstarch, or flour)/water mixture into boiling broth, stirring while you pour. (I usually make gravy with a whisk. On picture taking day, I used a wooden spoon. Either one works, but a whisk usually helps in case lumps want to form. Step Six: Stir at medium to high heat until gravy thickens. Turn down the heat and allow the gravy to simmer for a minute or two. Salt to taste and serve your gravy. If gravy refuses to thicken, stir in tiny bits of arrowroot powder (or cornstarch, or flour)/water mixture until it is thick enough for your liking. If gravy is too thick, stir tiny bits of water or milk to thin it out. If gravy doesn’t have enough lumps for your liking, add sprinkles of arrowroot powder or flour and just try to stir them in. They won’t stir in no matter what you try, thus causing lumps. If conversation around the Thanksgiving Table is lagging…challenge your guests to say “Bring Broth to a Boil” five times fast. That’s sure to liven up any party. My mom makes gravy using the giblets and stuff, and they skims them out before serving of course! I plan on making gravy this year by using a smoke turkey wing (maybe 2 depending on the size) and roasting it w/onions, carrots and celery. And turkey stock. (made from previous meals of roasted turkey) I got it from teh food network.. Chef Tyler Florence showed us how to make it. I usually did the above, (plus the giblets) but I want to change it up a bit. I once had gravy with hard-boiled eggs in it. Not the tasty kind of gravy lumps, in my opinion. I use the fat and flour method. You mix in flour and cook it with either some of the turkey fat you skim off of the broth or with butter if I am just making gravy with canned stock. After a few minutes you can whisk in the broth/stock. Always turns out great! I do what Emily does. My ratio is 1 part flour:1 part butter: 8 parts broth. From a 14 pound turkey I recently cooked, I got a little over 2 cups broth, so I used 1/4 cup flour and 1/4 butter. Make the roux and add in a little broth at a time so that you don’t get lumps. I used whole wheat flour this time and it turned out great, you just get pretty speckled gravy. :-) I do have some arrowroot powder, so I’ll have to give your method a try too! If I make the turkey ahead of time, do I make the gravy ahead of time too or the day of? You CAN make the gravy ahead of time if you want. I usually make it the day of since it doesn’t take very long. I’m sorry but here in the south it’s just not good poultry gravy unless it has chopped up liver, heart and gizzard in it. Otherwise your recipe looks really good. I made my (12 lb) turkey today following your easy turkey cooking method (thanks! ), but I ended up with very little broth. Like less than 1 cup. I need to somehow stretch that into enough for both reheating the turkey and making gravy. I have the turkey carcass simmering on my stove now to make bone broth. If I add some of that to the turkey-cooking broth, will it work for making gravy? That should work out fine! Season the bone broth and it will be delicious! I used this recipe last year and am using it again today. Yummy and reliable.